Our most popular for the best reasons. Kayaks are towed up the river by our boat just before high tide and released for your return with the outgoing tide and the natural river current. Easy paddling for all ages. We are able to traverse deep into the mangrove channels that contain the largest Red Mangroves in the world and explore the eco system that provides the nutrients for the beginning of the food chain for all fish. It is a hatchery for small fish and a haven for marine birds, reptiles and animals. Often seen are Osprey, Boat-Billed Heron, Green Heron, Ibis, Whimbrel, Willet and Ringed Kingfisher. And on a special day the endangered mangrove hummingbird or the yellow billed cotinga. A quiet and relaxing way to enjoy the sights and sounds of the river, explore deeper into the mangrove estuary and its various coves and tunnels. Snorkeling at a beautiful and vibrant coral reef only 20 minutes South of Saladero by boat. Sargent Majors, Angelfish, Moray Eels, Blue Tang, Jacks, Triggerfish and small rays are plentiful. $50 per person, two person minimum. Duration 2 - 2 1/2 hours depending on tidal current. A relaxing river tour that explores the maze-like mangroves of the Rio Esquinas. This is where the salt water Golfo Dulce meets the fresh waters of the river and the mangroves form a thriving estuary for fledgling fishes and nesting areas for many marine birds. The mystic mangrove estuary is a paradise for birding. Watch for crocodiles sunbathing on the banks or logs. Designated a marine sanctuary by the government four years ago, the wildlife is not under any undo pressure and is seldom visited by tourists. Birders won't miss scores of Whimbrels and White Ibis. Other birds we've spotted include Osprey, Yellow-headed Caracara, four different species of kingfishers and Boat-billed Heron. Tide dependent. $65 Per person, 2 person minimum. The morning birdwatch begins around 5:15 am until 7:00/7:30. Afternoon birdwatch starts at 3:00 to 5:00. Hike in the gardens, secondary forest, around our mangrove area and in primary rainforest. If you include the Golfo Dulce with marine birding we have 5 different ecosystems all within walking distance of each other. Why Go Birding in Saladero Eco Lodge? There's something here to satisfy all types of birders. Those hard-core "listers" will likely come for the Yellow-billed Cotinga, Scaly-throated Leaftosser and Black-cheeked Antthrush, which are found with relative ease in the forest trails behind the lodge. The Cotinga can only be seen when the wild nutmeg is flowering, which is from December to March, but the other two are available year-round. The Mangrove Hummingbird may also be a target of hard-core birders, and it can be found in the mangroves beside the lodge year-round. Have you ever tried birding from a kayak? You can do that at Saladero Eco Lodge. About 20 minutes away from the lodge by kayak, traveling on the quiet waters of the Golfo Dulce, you will come to a small mangrove area where you can't miss the unique Mangrove Hummingbird. Yellow-crowned Night Heron, Tricolored Heron, plovers, kingfishers, and other beach and mangrove birds can also be seen here. If you paddle on just a little longer, there are areas where the primary forest is almost hanging over the sea. It's quite an experience to be in the ocean in your kayak, and yet under the shade of this pristine forest, and be able to see forest birds like the Collared Forest-Falcon and Swallow-tailed Kite. $30 per person - 2 person minimum. $25 for 3 or more persons. A Garden of Eden with mass plantings of orchids, bromeliads, helaconias, cycads, ornamental palms and flowering gingers, Casa Orquideas is a local botanical gem. The guided garden tour includes touching, tasting, smelling and simply amazing yourself at one of the most complete private tropical plant collections you've ever seen. Casa Orquedia represents 40 years of hard work and dedication from Ron and Trudy MacCalister. Guided tours are on Thursdays and Sundays. During the scenic 20 minute boat ride to Casa Orquideas it may be possible to see dolphins, sea turtles, rays leaping from the water and ocassionally whales. Casa Orquideas Tour $45 Per person, 2 person minimum. 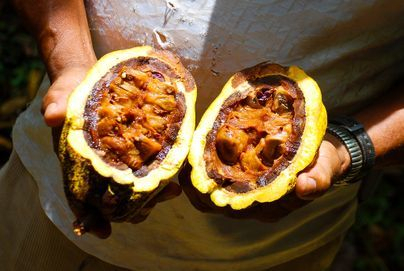 We travel by boat West across the Gulfo Dulce to Playa Blanca on the Osa Penninsula, where we board a taxi for the short trip to Finca Kobo to learn about and experience the process of growing, fermenting, drying and making chocolate. As part of the guided tour of this amazing organic farm you will pass through a “biological corridor” where wild animals and the farm coexist together. The tour culminates in tastings of wonderful chocolate fondue with fresh fruit and homemade banana bread in the middle of a tropical garden. Chocolate products are available for purchase and make a wonderful souvenir to take home. $85 per person for 2 people, 3 or more $65 person. Two person minimum. A guided hike through a series of three trails at Saladero. Rainforests are the Earth's oldest ecosystems. These incredible forests cover only 6 % of the Earth's surface yet they contain MORE THAN 1/2 of the world's plant and animal species! Huge hardwood trees with massive buttress root support structures entertwined with vines. Learn about the different layers of primary rainforest and why the rainforest is so important to our survival. Look for animals, insects and birds. Emphasis is on the importance of the primary rainforest, diversity, symbiotic relationships between plants and animals, mini-ecosystems within the rainforest and medicinal plants. "As many as 30 million species of plants and animals live in tropical rainforests." From the beach, in the river or offshore, fishing opportunities abound at Saladero. You can use our kayaks and fish anytime you like. Excursions in the Rio Esquinas or Golfo Dulce are available and off shore trips arranged upon request. We have caught bonita, spanish mackerel, barracuda, golden travelly and grouper in the gulf while the river is known for red snapper and snook populations. Inshore/River Fishing – Guided inshore fishing in the Golfo Dulce and the Rio Esquinas. Tide dependent for fishing the river. 19’ boat with fiberglass roof, all rods, lures and fishing equipment included. River/ Gulf Fishing Excursion $50. Per person, 2 person minimum. Offshore Fishing – Fish with local certified Captains either inshore for Red Snapper, Roosterfish or Mackerel or offshore for Marlin, Sailfish, Tuna or Dolphin. Prices range from $400 to $1,350 dependent on ½ day, full day, inshore or offshore. With most captains prices for ½ day charter include water, soft drinks and beer. Full day includes water, soft drinks, beer and lunch. Contact us for quotes. Please schedule in advance of your trip to guarantee the booking. A 50% deposit is required. Includes boat transfer to Playa Blanca, taxi to and from the canopy tour, the canopy tour and boat transfer back to Saladero. An adventure tour with a bird’s eye view of the canopy. The last line is the longest on the Osa and you will reach a speed of 80 MPH, In secondary and primary rain forest. Fresh fruit and drink after the tour. Look for dolphins, whales and turtles on the way. 4 or more persons $110 per person. 2 to 3 persons $125 per person. Diving around Gulfo Dulce is a unique experience. You have at least three good dive destination options: Los Mogos (20 minutes away), Widow's Peak (35 minutes away) and Matapalo (1.5 hours away). The water temperature varies greatly from 85 degrees on the surface to 75 degrees at depth. There are thermoclines, however, and the visibility typically improves with depth. You will see turtles, angel fish, lobster, stingrays, grouper, trigger fish, puffers, schooling jacks, parrot fish, tangs, snapper, octopus, spade fish, scorpion fish, amber jack and the usual small fish like sergeant majors, blennies, etc. You will need to bring your own BC, regulator and light wetsuit. It is best for experienced intermediate to advanced divers due to some minor current and visibility factors. Expect to pay a little more than other dive destinations due to the very personalized service. Diving is through several dive operators in Golfito. Contact us for pricing. Here are two companies that organize expedition type kayaking trips in the Golfo Dulce. If your focus is more into kayaking, these are the best providers in the Golfo Dulce. More information on our links page.